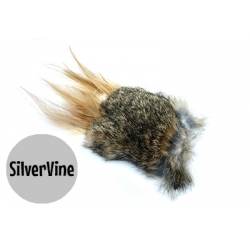 This SilverVine Wild Hare Puff will have your Furkid growling, shaking, attacking and slobbering with delight! Each Wild Hare Puff comes in various sizes and shapes with natural turkey feathers. Infused with 5 grams of Pure Silvervine leaves inside. If you’ve never heard of Matatabi SilverVine , this is your cat’s lucky day. A plant native to the mountainous regions of eastern Asia, silver vine has been used in Asia for centuries as a preventative health aid. It’s also widely used in Japan and China as a cat stimulant. When exposed to powdered silver vine, cats enter a euphoric state that involves behaviours like rolling, chin and cheek rubbing, meowing, drooling and licking. Reactions vary from cat to cat, but the bottom line is that they all go nuts for the stuff. Effects generally last from 5-30 minutes. Sounds like catnip, right? Well yes, it does, except it’s more potent due to the presence of two cat attractants as opposed to catnip’s one. A study from the University of Illinois found that cats showed a preference for silver vine over catnip both in terms of initial attraction to an object containing the substance and time spent interacting with it. If your cat doesn’t respond to catnip or has grown bored of it, silver vine may be exactly what the doctor ordered. The Wild Hare Puff is made from Wild Hare and feathers. This is a more expensive product due to only using a by-product from 100% genuine Wild Hare fur. The fur is a by-product from free roaming Wild Hares living a natural outdoor life in Germany, Netherlands & Poland and are protected under EU Animal Welfare Wildlife Laws. Wild European Hares have protected seasons so availability of the toys are dependant on the amount of welfare conservation control needed. Far better than the cheap rabbit fur toys from cruel factory intensive farms with no welfare protection and any fur from China.